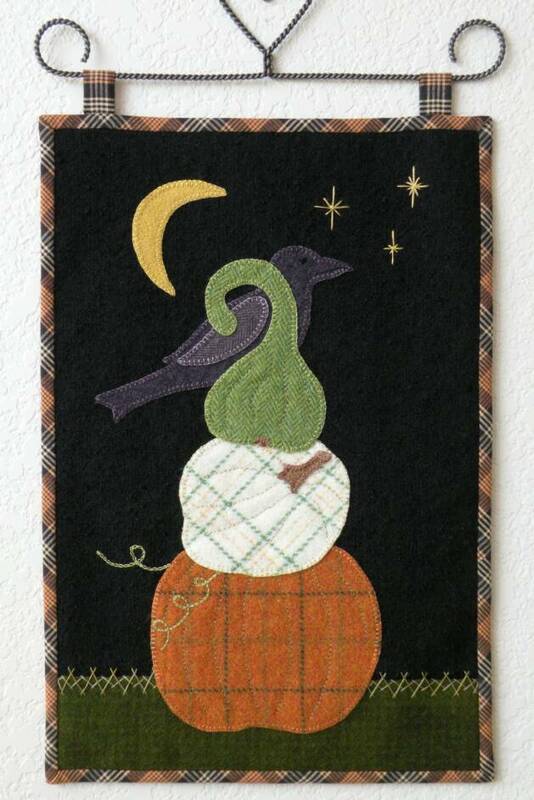 The inspiration for this piece comes from one of my favorite aunts who I spent a lot of time with as a child, learning to sew from her. 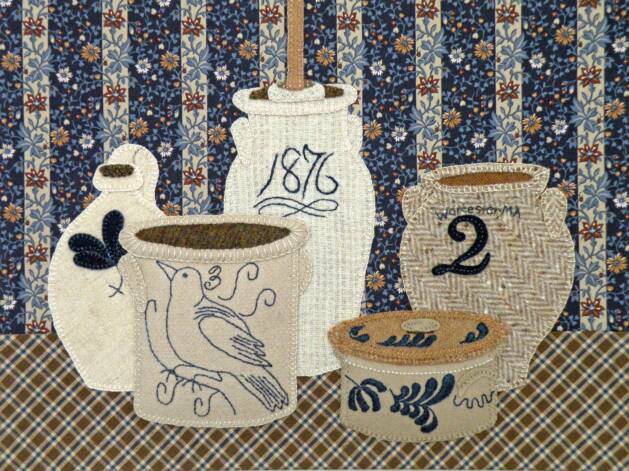 She owned one piece of Watt Pottery, a creamer just like this one. 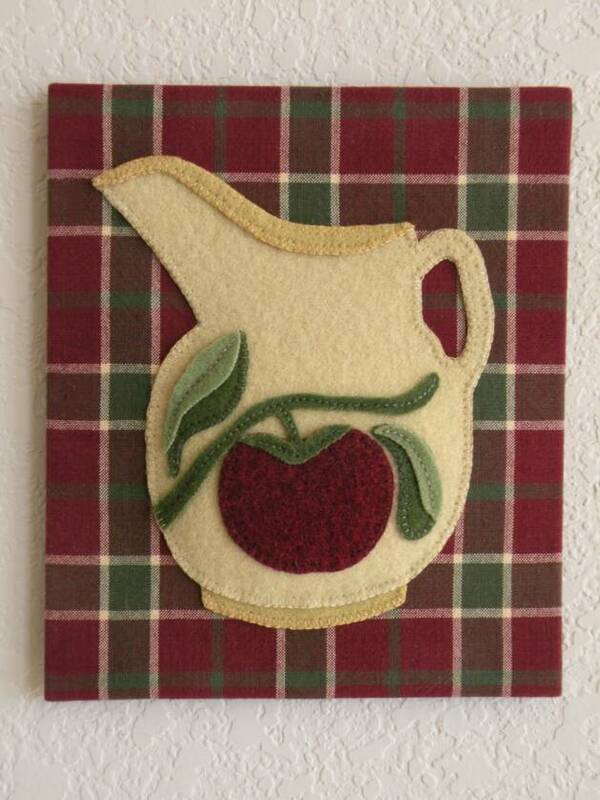 Unfortunately, I do not know where the pitcher came from, but she used it often when she served coffee and dessert. She was also a wonderful baker, so dessert time at Auntie Von’s was always special. 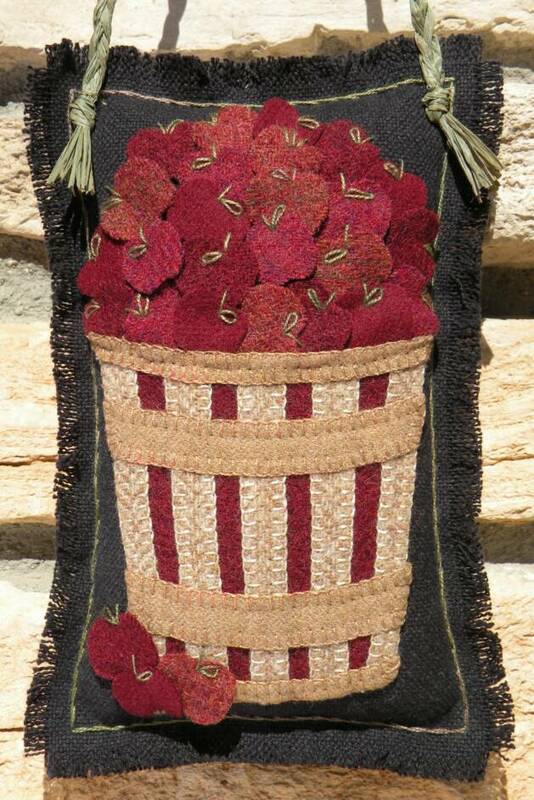 Why did she love the apple-decorated pitcher so? Is it possibly because she had several Baldwin apple trees on her property, and made apple pies almost every week in the fall? I’ll never know, but I do know that my love of this creamer is wrapped up in the memory of her love of sewing, baking and sharing time with me! I have a sister-in-law, (who is more like a real sister to me,) who is an avid gardener, and her passion is hydrangeas! She happens to love spring more; I happen to love fall more. But I have gained an appreciation from time spent with her over the years, of her enjoyment of that time of year when trees and plants bud out and begin to display their hidden beauty. She has taught me to enjoy the colors of floral blooms almost as much as I love the fall display of colorful leaves. Whenever we travel down to the Cape, we go in search of beautiful hydrangea blooms; they just are magnificent! While we both appreciate the variety of colors available in hydrangeas, we both agree that the blue is the best! We have also learned to anticipate the changes within the blooms, as summer moves on, and even as fall approaches; we watch, and enjoy, as the blues transition to shades of purple, the whites blush to deep rose and the pinks deepen to magenta. So, to my wonderful family and friend, these Cape Cod beauties celebrate Brenda and her green thumb! When I think of fall in New England, I always think of searching out the farm stands for “the perfect pumpkin!” Some years that pumpkin is bright orange; other years it is butter cream white! On one annual fall trip back to New England, I stopped at a farm stand just to take in the enormous pile of “all things pumpkin!” I had never before seen that quantity or height of pumpkins piled one on top of another; it took my breath away – and of course, it required a picture of me in front of the display. Not long after that, I was traveling past that same stand in the evening, just as the autumn moon was peaking over the horizon, and over the pumpkin mound. Amazing to see the warm hues of moon lit pumpkins… I just had to imagine that somewhere out there a crow was perched peacefully enjoying the glorious display as well! 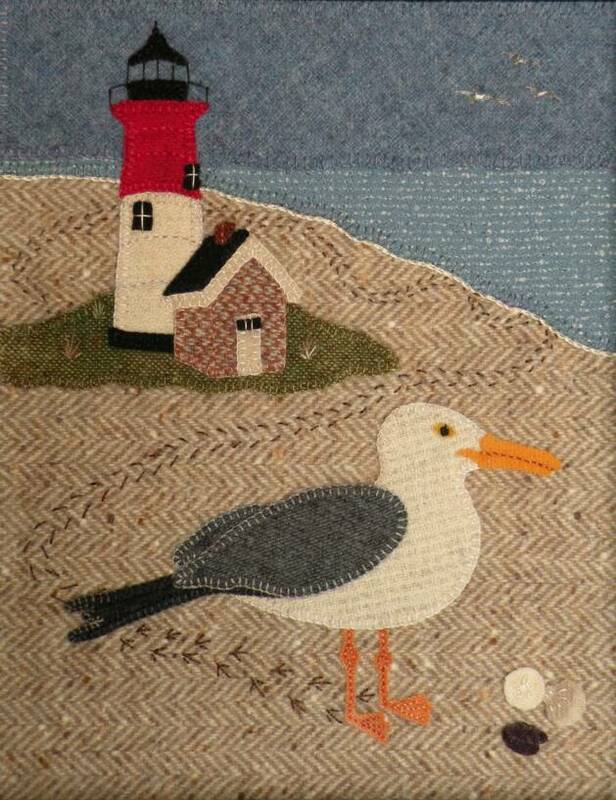 Nessy the seagull saw Nauset Lighthouse in the distance, as he drifted along a wind current enjoying the glorious view of the Cape Cod shoreline. The tall red and white tower beckoned Nessy to come in for a landing and take a closer look. He toured the lighthouse and its outbuildings and concluded it was a fine structure, a sound beacon of light built as a source of peace and safety for those at sea watching closely for the rocky shore. After his excursion Nessy decided he was hungry and went in search of a tasty treat of clams and scallops. As he enjoys his ocean feast, over his shoulder he can see his fellow feathered friends soaring high above in the distance. He wonders if they too will stop a while and enjoy the majesty of the lighthouse as he did. As soon as he finishes eating, Nessy will find another current to catch and sail on to explore another place! The inspiration for “Nessy Visits Nauset” comes from a very special person in my life, my very own “Uncle Nessy.” Over the past many years, I have returned to New England to enjoy the beauty of the place I once called home. During those visits, Uncle Nessy and I have made many sojourns up and down the coast searching for lighthouses to discover. My uncle taught me many things in life, and one of those is a deep appreciation and love for all things in nature, both on land and sea. We have delighted in walking the beaches of New England together drinking in the breath-taking beauty of the ocean, and watching the seagulls rise and descend on waves of air as they enjoy the view from above. To me, this piece is, “Quintessential New England in the Fall!” On my annual fall trip back home to New England last year, two friends joined me for their first exposure to New England. One beautiful October day, we found ourselves wandering the streets of a lovely Vermont town and came upon this towering stack of pumpkins and gourds. My friends were quite taken back and amazed at the display of colorful and oddly shaped fruits of the field. On the other hand, I, of course, smiled broadly and insisted on a picture beside the stack, which was nearly twice my height! I knew that these rich and sometimes splashy hues were an echo of the vibrant changing colors of the trees and leaves all around us. As the colors of fall danced their way up to the top, I knew that this was the artistry of a New Englander who loved the simple beauty of nature that surrounded them; one last tribute to fall before the more somber colors of winter blanketed this part of the country. Fall will soon be upon us, and for me that means “apple picking time!” One of my most enjoyable autumn experiences is to travel back to my home town and visit its apple orchard, Sholan Farm. The city of Leominster purchased the farm almost a decade ago and the volunteers who work the farm make it a most delightful place for young and old. My folks usually join me for at least one excursion to the orchard; my dad especially loves the Macoun apple variety and I love the McIntosh. We walk the paths between the apple trees together, taking in the aroma of ripe apples, the sounds of bees drinking from the fallen fruit, listening to the laughter of families enjoying a day outside, all the while absorbing the pleasures and privileges of being together. I hope this fall you visit a local apple orchard in your area and take the time to go pick apples with someone you love! Then go home and think of all the possibilities… apple pie, apple butter, apple crisp, baked apples, apple strudel, apple cake (are you hungry yet? )… or just a simple perfect apple plucked from the tree and eaten on the spot! Happy Fall! Here are several of my art pieces and what, and who, inspired me to create them! I have always had a great admiration for pottery, especially the grayish-tan stoneware referred to as “salt-glazed” that is so often elaborately decorated with deep blue “slip-trailed” designs. I have seen a few of them in the homes of friends, and at antique stores and markets, but I had never seen a large collection of them in person. Well, I decided to keep my eye out for a real Norton crock for my brother. I eventually found one at an antique store – but it was a very simple jug, plain and undecorated except for the stamped and slightly blued lettering that read, “F.B. Norton & CO, Worcester, Mass.” I was extremely excited to have found this gift, and pleased that I could purchase it for my brother. Though I had hoped to find an elaborately decorated piece at a roadside yard sale that no one save me knew the value of, I settled on the fact that I at least had found a real antique jug with the company name and location on it! Well, a few years ago my brother, sister-in-law and I had the opportunity to attend the “Brimfield Outdoor Antique and Flea Market Show” in Brimfield, Massachusetts. This event is an antique collector’s dream come true! Actually, it’s a living history lesson in what’s collectible for anyone who loves old things. Acres and acres of antique dealers come from all across the country, to set up in open fields that at any other time of the year look like typical grassy open spaces along a country road that you would normally just drive past and think nothing about. 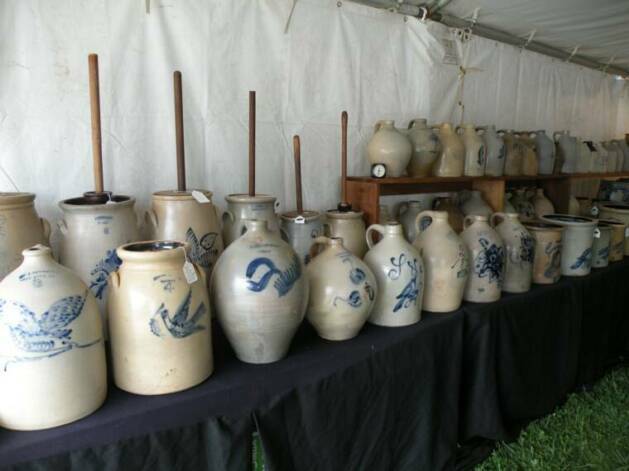 But three times a year this event transforms the gentle New England landscape into a sea of every type of antique imaginable; tables and tents explode with furniture, artwork, textiles, dishware, garden décor, pottery and almost anything that a person can think of to collect. We were walking along the main roadside and out of the corner of my eye I caught a dimly-lit tent filled with tables covered in rows and rows of aged-looking pottery decorated with these marvelous cobalt-blue birds and flowers and non-descript brush strokes. I turned on my heel (pulling my family behind me!) and entered the tent to find a kindly gentleman watching over his wares. 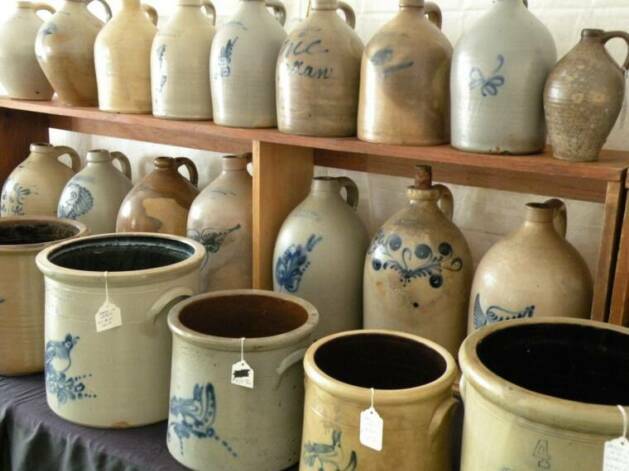 The antique dealer remained quiet but smiled at me when I looked his way and gave him a huge grin and said how I had never before seen that large a collection of salt-glazed crocks. I asked him if he would mind if I looked around at his offerings, noting that I knew I could not afford these valuable pieces of clay history but that I could appreciate their artistry and usefulness. As I scanned the tent and began to walk around what I saw surrounding me were beautiful pieces of artistry. What once had been simple stoneware thrown on a potter’s wheel for utilitarian purposes now posed as a reminder of the heart of the real artists who fashioned these simple clay pots into vessels of beauty. Their “signatures” were emblazoned in deep blue brush strokes shaped into all manner of birds, flowers, animals, leaves, trees, feathers, simple numbers denoting the volume of the crock, and others with names and places both painted and stamped into the clay. And believe me, there were plenty of crocks with the name, “Norton, Worcester, MA” stamped on them! There were pottery pieces in all shapes and sizes; jars and jugs, various gallon-sized straight-sided crocks, squatty handled crocks with lids, bulbous shaped ovoid crocks that looked too heavy on top to stand, and butter churns with and without their lids and churning sticks. Within these obvious shapes were even more variations of all kinds – short and wide, tall and slender, wide mouthed and narrow, handles and none! The range of color in the clay was amazing as well, from the fairest light gray to warm tan to the darkest rust; colors mellowed with age and use. And the blues used in decorating these wares ranged from the darkest navy to the most brilliant cobalt. I tried to take it all in, wondering what caused these useful but beautiful pieces of stoneware to become old-fashioned and outdated, replaced by other means. I was quickly reminded that at least some people still considered them valuable as collectibles from another time, another era. I finally had to say goodbye to my cool and silent friends and my family and I walked away discussing the simple Norton jug that I had found for my brother a few years back. I had just witnessed that there certainly were many more elaborately decorated pieces available to be purchased, but I was thankful for the plain, undecorated piece that I had purchased for him. I knew he appreciated my modest find for its sentiment more than its worth. We continued that day on our journey throughout the fields of antiques enjoying the treasures of the past, and each other’s company. My brother used to work for the Norton Company located in Worcester, Massachusetts. The company had been started by a group of ceramists and apparently some of the products the company produced were salt-glazed pottery pieces with their name on them. When my brother left the company he received a miniature-sized reproduction of this “Norton Jug” as part of his departure gift – not one of those antique pieces of Norton pottery that have become so collectible! In anticipation of the forthcoming fall season and the spectacular golden (and sometimes red) Aspen leaves that blanket the mountains in Colorado . 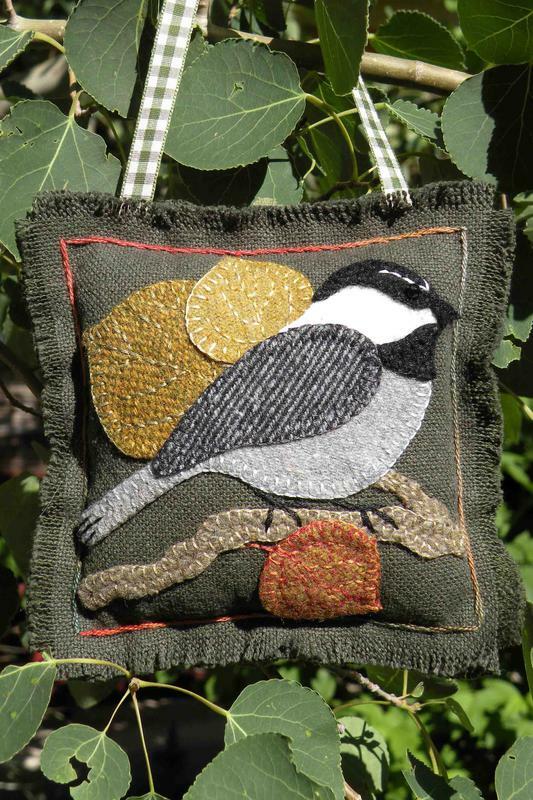 . . let me introduce you to "Chester" the Chickadee who sometimes rests on the branches of the Aspen trees in our back yard. The whirligig carvings were often referred to as “Sunday Toys” meant to allow children some play during quiet and reflective Sabbath observances. 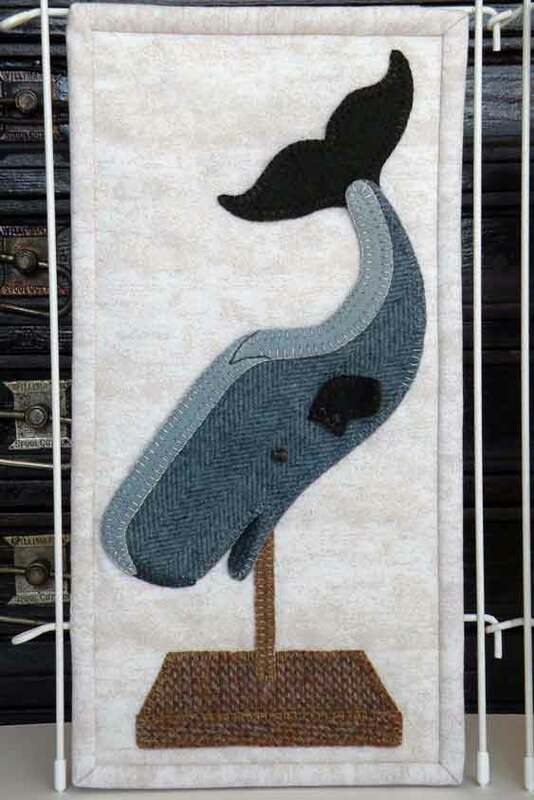 This series of wool carvings takes its inspiration from the many whales, shorebirds and whirligigs carved during that time, and the many still artful ones carved today! 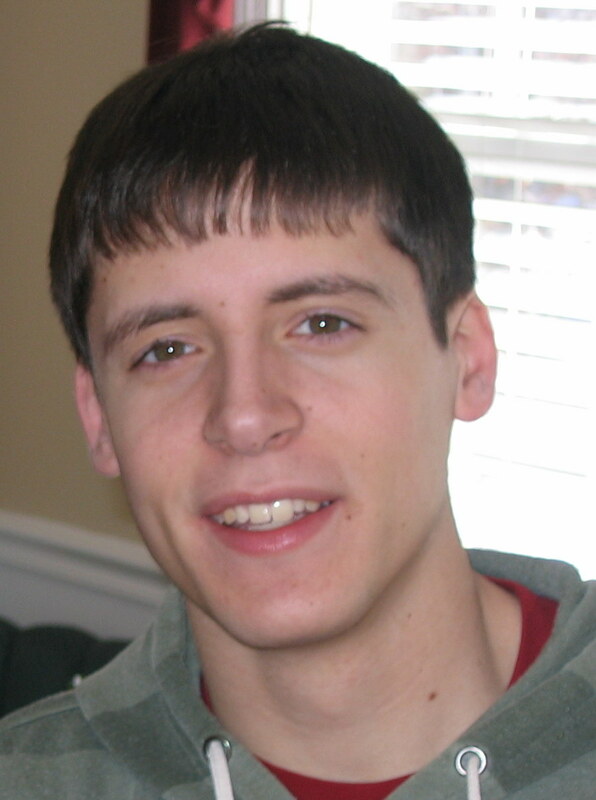 In May 2009, I was home visiting my family during the holiday. I have been home during other Memorial Days in the past, to watch my city councilor dad march in the traditional parade or to travel with him to neighboring towns to hear him speak on behalf of honoring veterans. This year though I asked if I could assist him and his comrades as they “flagged” the cemeteries on the Saturday morning before Memorial Day. This is a tradition that has its roots in the start of Memorial Day. Originally the holiday was named “Decoration Day,” and is thought to have originated around the Civil War (some say during, others after), when Americans decorated the gravesites of fallen soldiers. In Leominster, a group of veterans ranging in age from 50’s through 80’s goes out early in the morning to one particular cemetery and places a bright new flag on the gravesite of every man or woman who has served our nation in the armed forces. Several groups of Boy Scouts take on this responsibility in other cemeteries across the town so that all are honored. Family members usually also add their tokens of love and remembrance to many of the gravesites in town – not just the veterans, and often these displays are pots of bright geraniums. The leader of this group was a man in his early 80’s, a veteran himself. And, though time had worn down his body, it had not touched his spirit of service to our country. Mr. Leger directed the volunteers with precision, checking off sheets of paper that identified every veteran buried in the various cemeteries in Leominster. Mr. Leger sadly passed away recently, and I can only imagine the sadness that will permeate the group this year as they prepare to honor veterans, including Mr. Leger himself with a flag on his gravesite. The tradition will continue, because the love of country and its symbol the American flag is strong in Leominster as it is in so many towns across our nation. 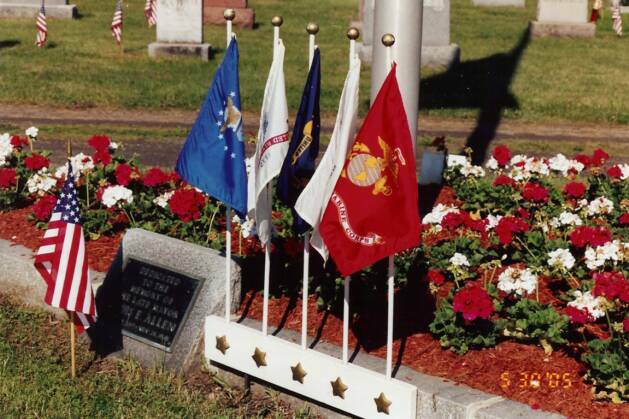 Perhaps this year, when you attend Memorial Day services, or drive past a cemetery you will note the varying displays to honor veterans. And if you plant up pots of geraniums to decorate your home, I hope you will think about the images I’ve described here and say a prayer of thanksgiving for our nation, its freedom and the men and women who keep it that way. The tradition of placing flowers on gravesites is also very strong back East. My family still carries on that tradition with the start of Memorial Day. The cemeteries in Leominster allow people to place flower pots on the gravesite or to plant perennials and annuals into the ground. 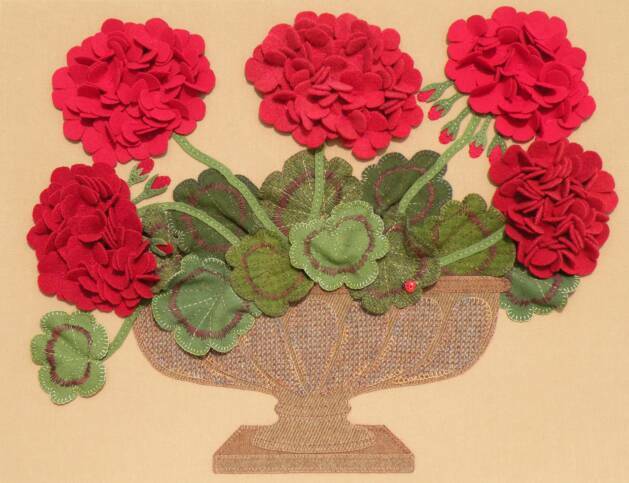 One of the most prolific flowers you will see at any garden center in that area leading up to Memorial Day is the geranium, as it is one of the most used flowers to decorate cemeteries and homes alike. I love to see tables tightly packed with an amazing array of the many different colors that geraniums are grown in – deep rich red, bright orange-red, clear white with tinges of pink, coral, salmon, pale pink, deep fuchsia – oh my, and even the leaf colors vary from deep rich green, to bright yellow green, some marked with two tones of green or a band of maroon encircling the leaf. About the mid part of May, I start to get itchy to dig out my gardening tools and pots, and go shopping at the local garden centers for flowers. Unfortunately, I know better than to get ahead of myself. See, where I live at 6,800 feet in Colorado, we can still get frost through the end of May. And, we can and often do, wake up to snow on top of Pikes Peak (14, 000 feet) well into July! 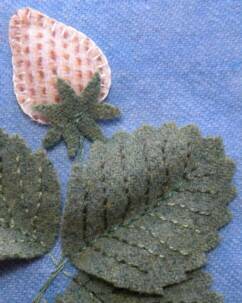 So, I wait a bit longer than other parts of the country to start my outside embellishing! Planting up flower pots to decorate the outside of our home seems to be an inherited tradition with me. There are beautiful and abundant garden centers in central Massachusetts where I grew up, and every year my mom, uncle and aunt visit several of them before making their selections both for their homes and to decorate the gravesites of loved ones. 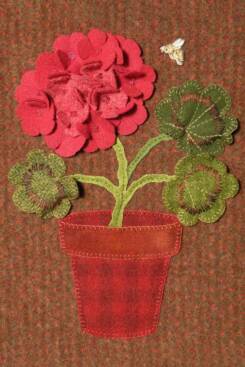 Mom often chooses a hanging planter spilling over with colorful ivy geraniums for her front porch. In recent years when I have been home in May, we have created planters for her with a variety of flowers as my knowledge of plants has grown. My uncle pots up several different containers on his patio with a selection of flowers including chrysanthemums, begonias, marigolds and trumpet vine. 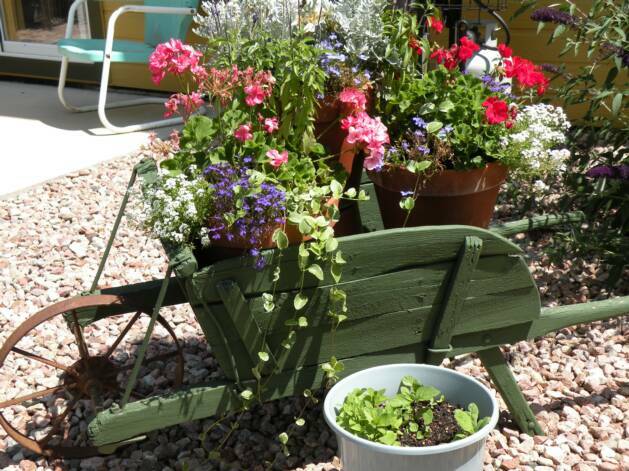 He used to have a tradition of potting up different sized clay pots with bright red geraniums, and setting them in his father’s old weathered wheel barrow which was painted a mellow leaf green. Since he now lives in an apartment, and I inherited the wheel barrow, Uncle uses his expansive knowledge of plants to change things up a bit each year. And I get to display the wheel barrow filled with flowering pots in my yard! Behind every piece of art that I create, there is a story that I love to tell. “Baking Up Some Memories” is no exception. There are many elements that contribute to making the ideas in my head become tangible pieces of my heart: the people who I think about when I am putting together a design idea, the objects that I pull from all rooms of my house to "pose" for my sketches (like the antique bowl in this piece) and the wools that I choose because of their colors and textures transform from a simple piece of fabric to some element in my work. When on Friday nights my brother and I would spend the evening with our aunt and uncle, Auntie Von would always have homemade brownies for me and homemade pies (usually apple or blueberry) for my brother . Auntie Von was the one person who was constantly baking and cooking and from whom I learned how to make all sorts of great food through the years - things like chocolate zucchini bread, sugar cookies, pumpkin pie made from a real fresh pumpkin, and of course gingerbread cookies. While I may have learned a special recipe or technique from each of these people, what I experienced through baking together was their devoted, wide open arms of love –their smiles and warm hugs of encouragement, their shared laughter when recipes flopped, and the sweet joy of savoring together something made with our own hands. Growing up in an Italian/French-Canadian family, food is a huge part of every holiday, and desserts of course are extra special when you are a kid. For some reason, I liked baking more than I did cooking (until I married a man who loves to cook and now we do a lot of cooking together!) 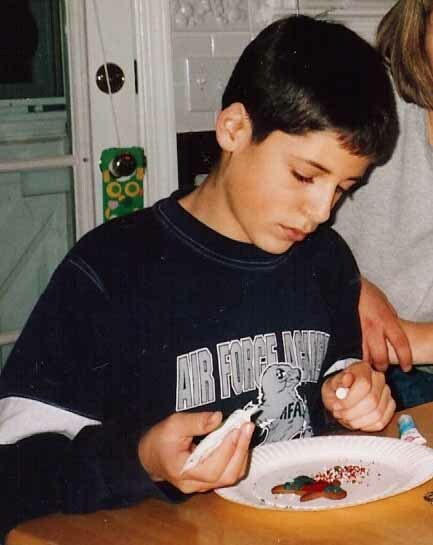 And so it became a tradition for me growing up that I had to do some sort of baking over the Christmas holiday school break. We also had a warm, family-like relationship with our neighbors who lived across the street. Every Christmas Eve after we had spent hours visiting many of my grandparents, aunts, uncles and cousins we would take the short walk across the crunching snow at almost midnight to visit some more, and eat some more! Their daughter, Lee, was especially close to my mom and to me. On one Christmas Eve, she gave me my very own set of gingerbread people cookie cutters – cutters that to this very day I still use! 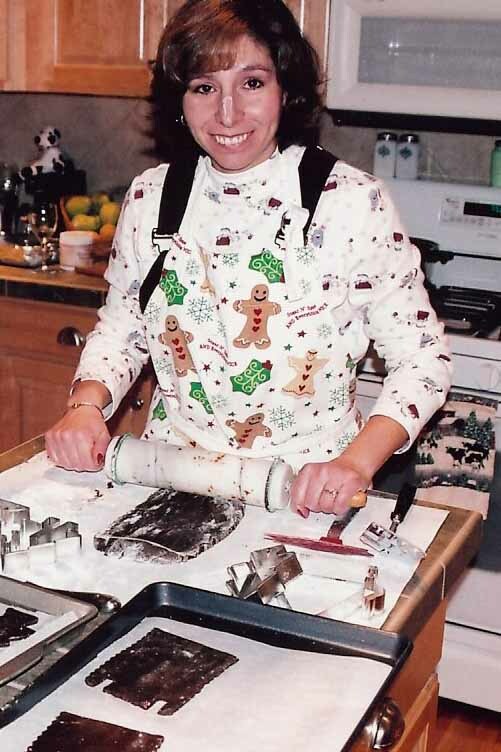 Those cutters became a treasured gift from this dear friend, and from that time forward I began to take an interest in baking decorated cookies at Christmas time. 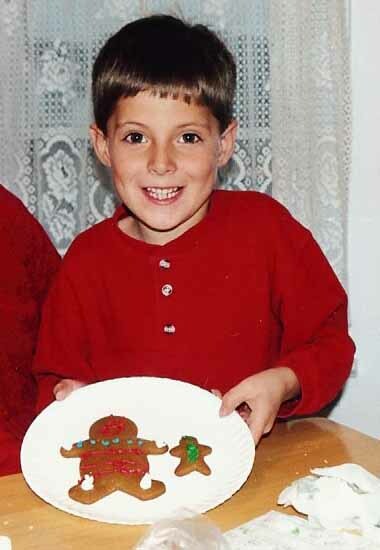 And while I didn’t always make them every year, baking up gingerbread cookies become a special way of remembering these love-filled memories of my childhood. 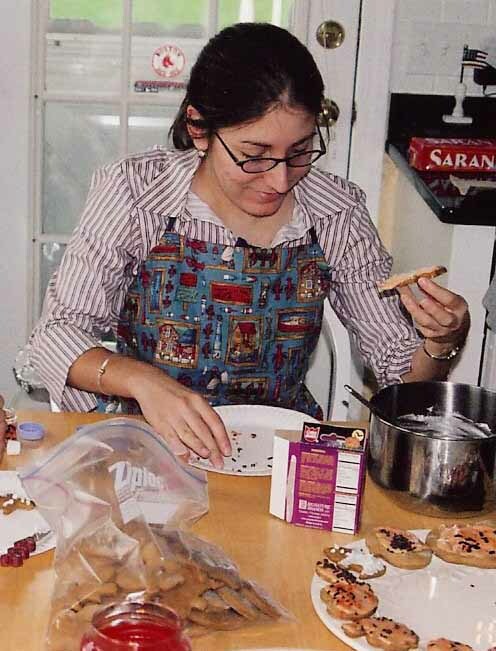 I’ve continued to bake my whole life and will try almost any recipe, and try it out on anyone who is willing – usually with good success, thankfully! But I also continue to make the traditional recipes that I experienced growing up. 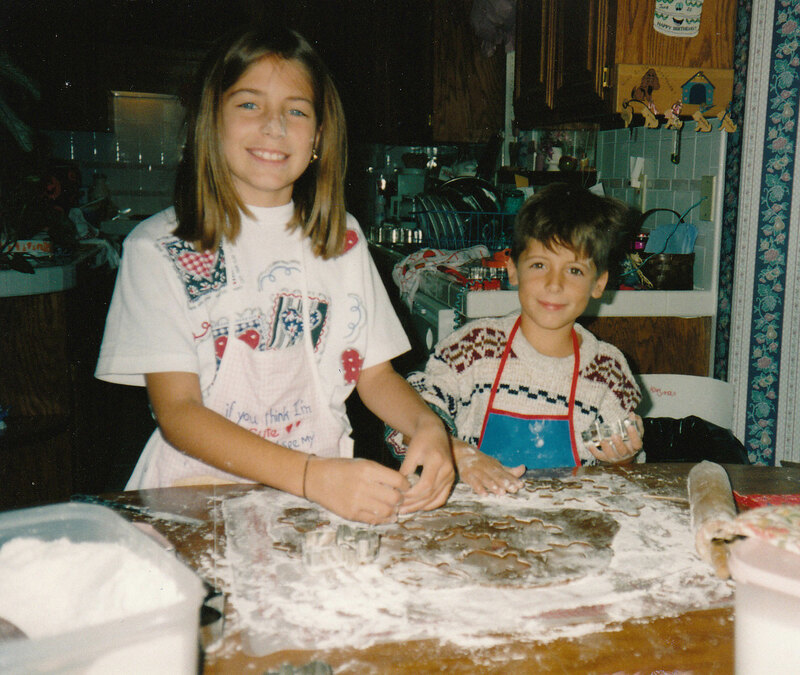 Many years ago when my brother married and my niece Stephanie, and nephews Stephen and Nicholas were each born, I decided that even though I lived thousands of miles away from them, I desired for them to experience the joys of learning to bake, with someone who thought they were just the most amazing people – just like I had experienced with my family members. 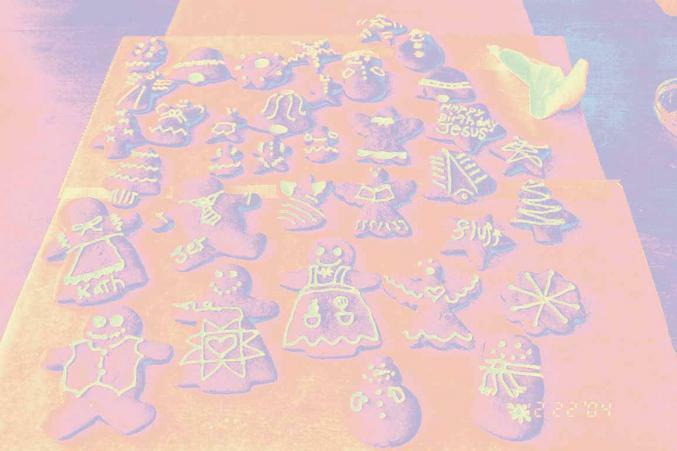 And so, I began to make it a tradition of baking gingerbread cookies with them every time I was with them over the Christmas holiday – only it turned out that they liked gingerbread so much that we had to make them no matter what holiday it was when I saw them – Fourth of July, Thanksgiving, Easter or whenever! Throughout the years, I have rolled, cut and decorated everything from bats, pumpkins, turkeys, apples, maple leaves, pilgrim hats, stars, bunnies, flowers, hearts, reindeer, bells, snowmen, Santas, angels, and candy canes to yes, the traditional gingerbread boy and girl, though I do not remember ever making shamrocks! Now, we bake gingerbread even if it isn’t a holiday at all, especially if Nicholas has anything to say about it! (He is especially fond of these cookies!) 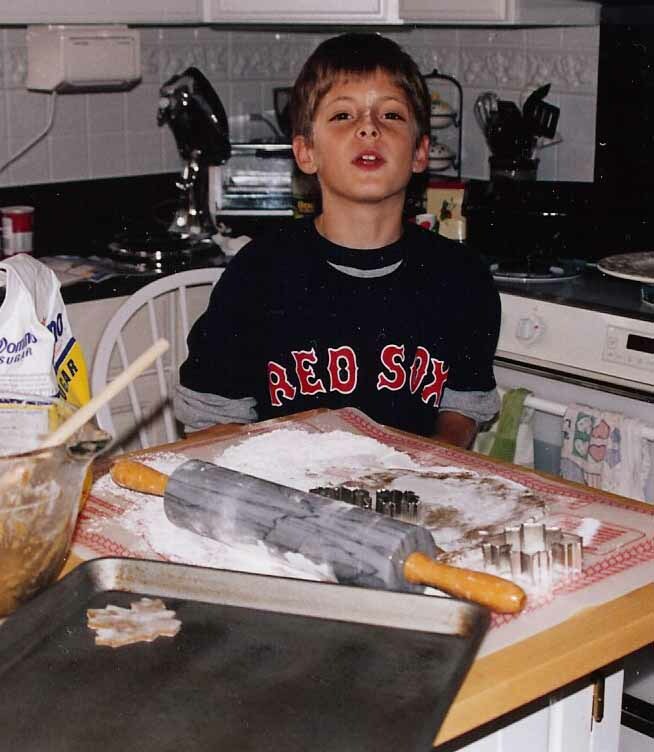 The only important rule in baking with Auntie Kathy was and still is that you have to make sure you have flour strewn everywhere in the kitchen, and most especially on your face! Each of the kids seems to enjoy cooking, baking and experimenting with different foods more and more through the years on their own and together as a family. Their dad is known for making pies with them, and their mom makes cookies, brownies and fudge. I think I’ve been able to contribute some good memories as well through the years as we’ve baked cookies, pies, tarts, puddings, breads and so much more. We’ve all laughed and made a big mess in the kitchen, then cleaned it up and sat down together to enjoy such simple delights as fresh baked cookies, hot cocoa with marshmallows or “Fluff”, and warm smiles and conversation. This pattern is dedicated to these three precious and dearly loved people, Stephanie, Stephen and Nicholas, who really aren’t kids much anymore, but who still love to spend time with their Aunt (and their Aunt loves to spend time with each of them!) I think it’s a good sign when they even make the time to bake gingerbread together when I am not around! 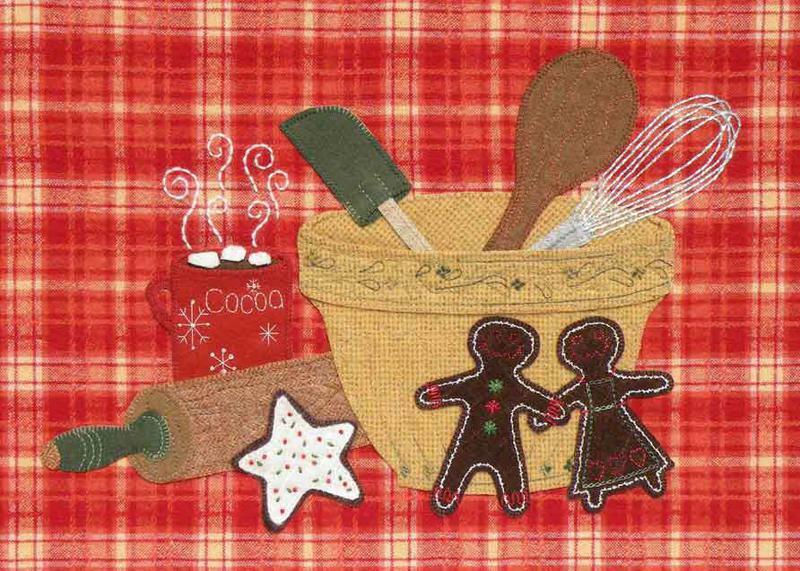 May you be inspired to bake up some of your own memories with loved ones, whether it’s with cookie dough, wool and thread or something else that connects you with that important person in your life – be it someone young, or old. Thank you for reading about mine! Wow, they sure grow up fast! I have lots of warm childhood memories of doing various types of baking with family members who showed their love for me by spending time together. Although my mom would tell you that she is not a baker, we made all sorts of goodies together while I was growing up, like “Snack ‘n’ Cakes,” chocolate/vanilla-graham cracker-banana pudding and any kind of quick-to-make packaged cookie or sweet bread that we could then gobble down after supper! My Auntie Lorraine, along with Uncle Nessy’s help (yes, the Uncle Nessy behind “Nessy Visits Nauset”), taught me how to make wonderful Italian pizelles (on a cast iron press, one at a time!) and Italian biscotti’s, or anise cookies – learning to feel the right texture of the silky dough to yield the tenderest cookies. Meet my mom, Pauline, the person for whom "Of One Heart" was designed. You see, her hand, and my hand were the models used for this design. And this design was my very first! a forgiving spirit and the ability to believe in myself. and this picture are truly special to me! "Of One Heart" is meant to celebrate the ties that bind us - family and unconditional love. 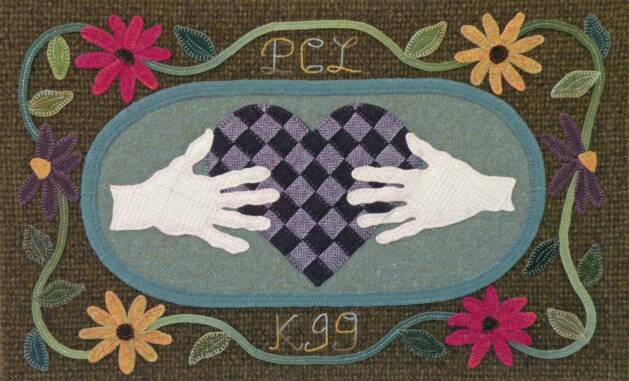 Two hands together, holding onto a real woven heart, symbolizing two separate individuals who are bound together by love. 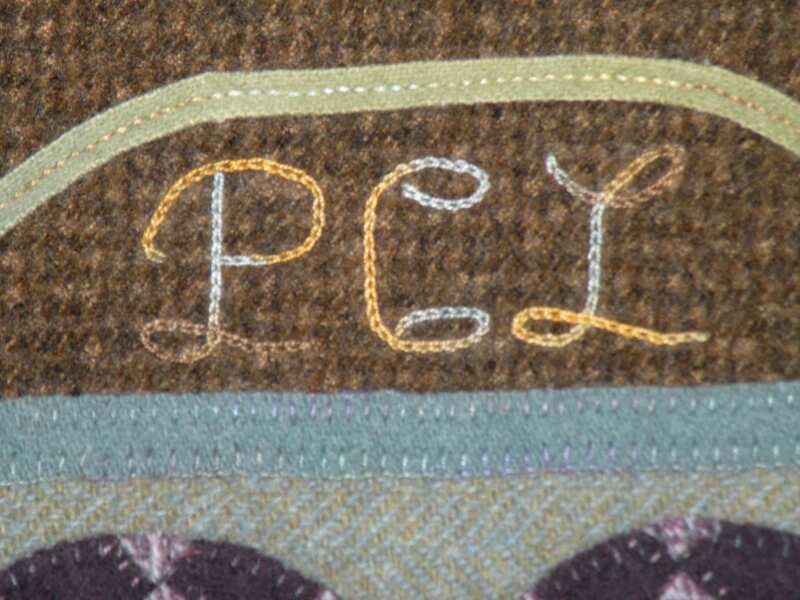 The pattern includes a complete alphabet for stitching a personalized version of the design, or you may stitch the title in that area, (and the pattern has that lettering as well.) It is a great pattern to make for a mom, a sister, or as a wedding gift or graduation gift! "Of One Heart" gives the stitcher the opportunity to let someone know how very special they are to them! 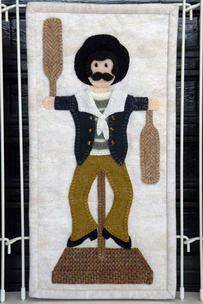 It was January and February, cold and snowy, when I first began to draw this new design and then to stitch it. We weren’t getting a lot of snow, not like my family who lives in New England and who has seen more cold and blustery winter days than they would like to this year! 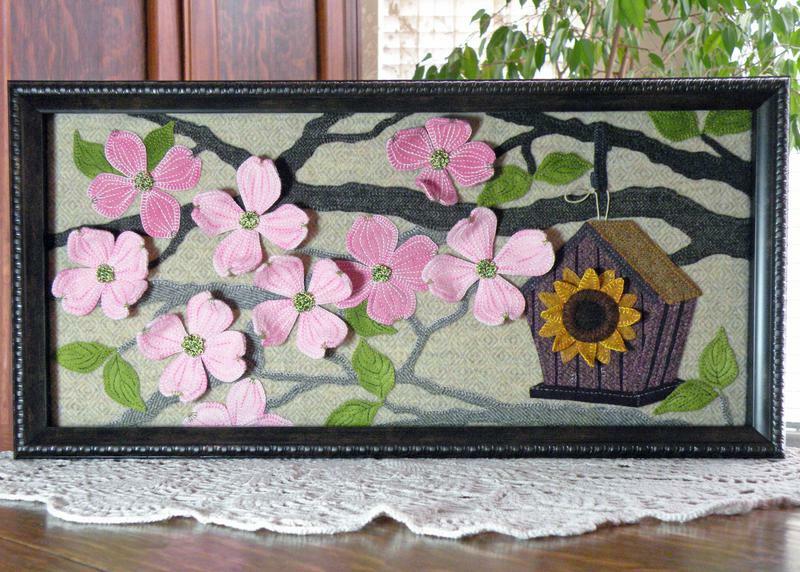 But as I introduce this new pattern, there are hints of Spring around my home and town. The pansies are pushing through the earth, the garden centers are advertising their Spring open houses and my daffodils are peeking their leaves out of the mulch. 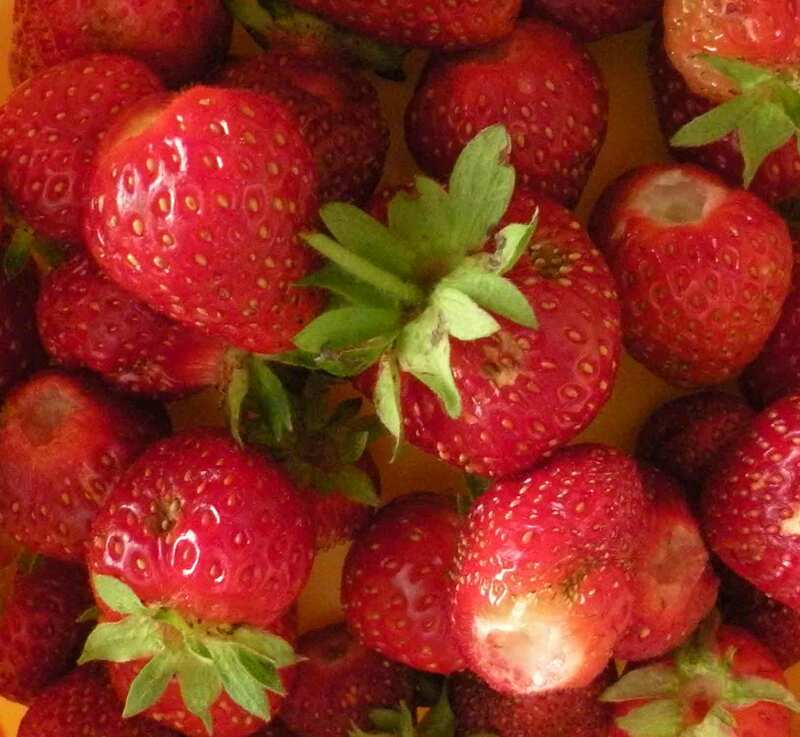 So enjoy all those red, juicy, sweet, fresh strawberries available at farmstands, and maybe from your own backyard (before the birds do)! 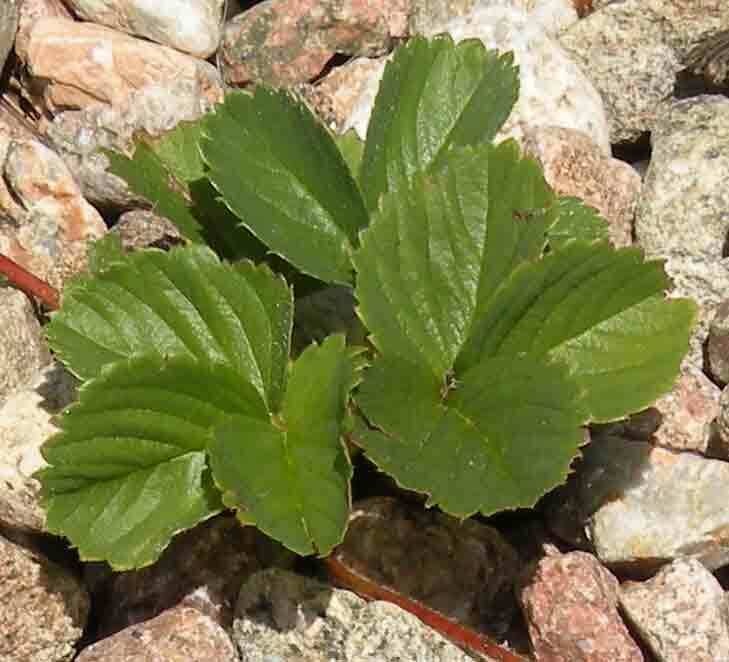 We had planted strawberry plants a few years before but they had not really yielded any sizeable quantity of fruit. This particular year there was an abundance of flowers and fruit and we could not wait to taste those juicy, sweet, delicious berries! 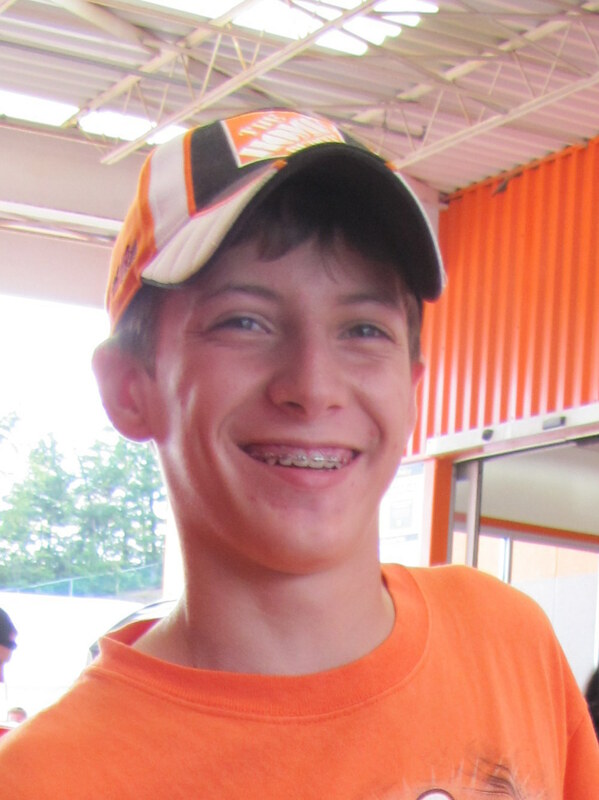 We were finishing up yard work on a Saturday (now my summertime chore!) and checked on the ripening fruit before going inside for the day. The berries were almost perfect, but my husband Jerry thought another day would make them just right, so we left them unpicked. Well, the next morning we were sitting outside on our deck having our morning coffee and we both suddenly looked at each other with questions on our faces as we heard sounds below us in the rocks that border our planting areas – irregular, scratchy sounds – like something living was moving around! 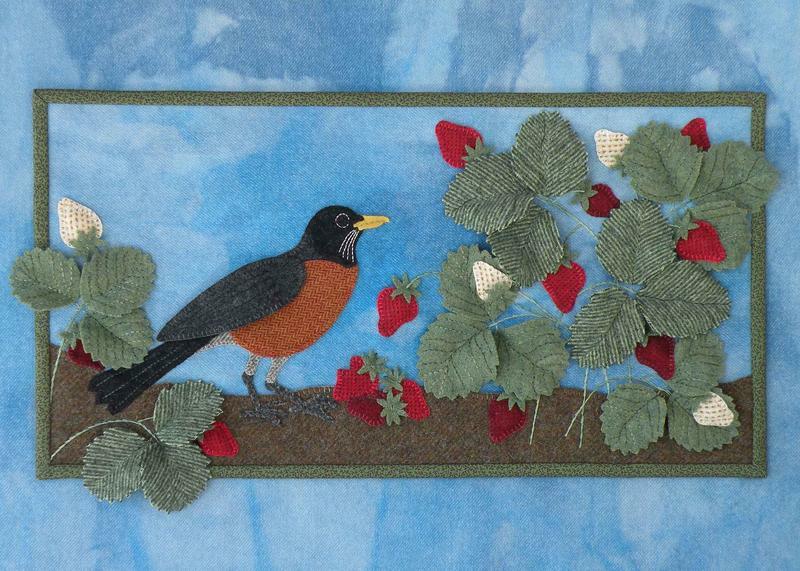 We both slowly peered over the deck railing and caught sight of a young robin hopping in between the strawberry plants, feasting on all our red, ripe strawberries!!! And, he wasn’t necessarily eating every berry completely, but seemed to taste just a bite from almost all of them, searching for the perfect morsel of deliciousness! 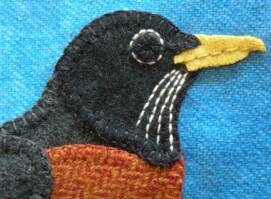 As an adult, I still love robins. Their memorable call stops me in my tracks when I am outside or near a window and hear them. I love their industriousness, their curiosity and their bright eyes. 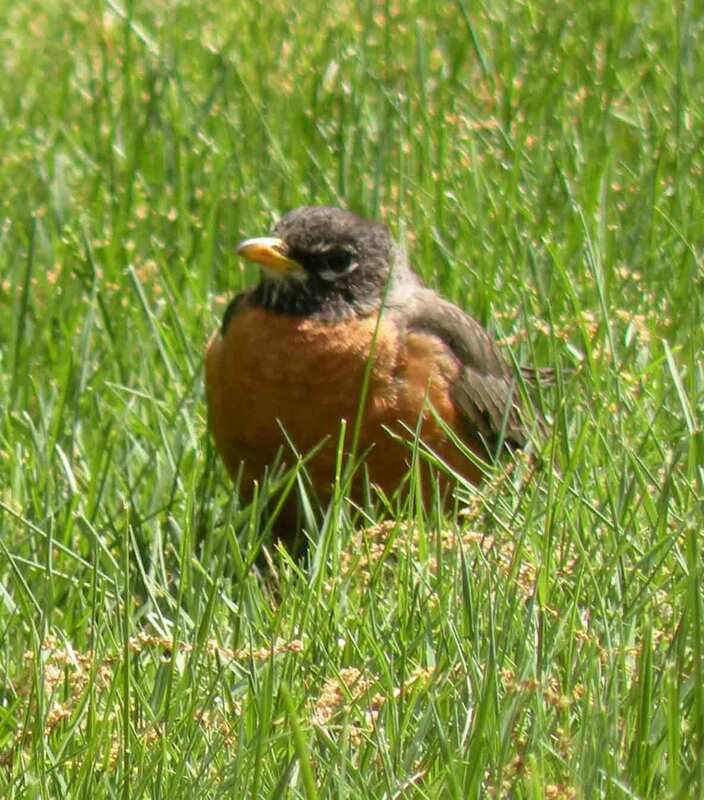 A few years ago we were blessed to have a robin build a nest underneath our deck. We watched as the parent birds cared for their young fledglings, taught them how to fly, and we believe, also taught them a little mischievousness in how to snack on our strawberry patch! We smiled at one another and chuckled, and I commented that, ‘well, at least there were enough berries to share with our feathered friends’ – or we hoped there were! We climbed down the deck stairs to inspect the remains and our friend flew off to a nearby tree. Thankfully he had not eaten every berry but had left a few for us to enjoy. Needless to say, we quickly made a trip to the hardware store to purchase netting to protect the remainder of the patch. 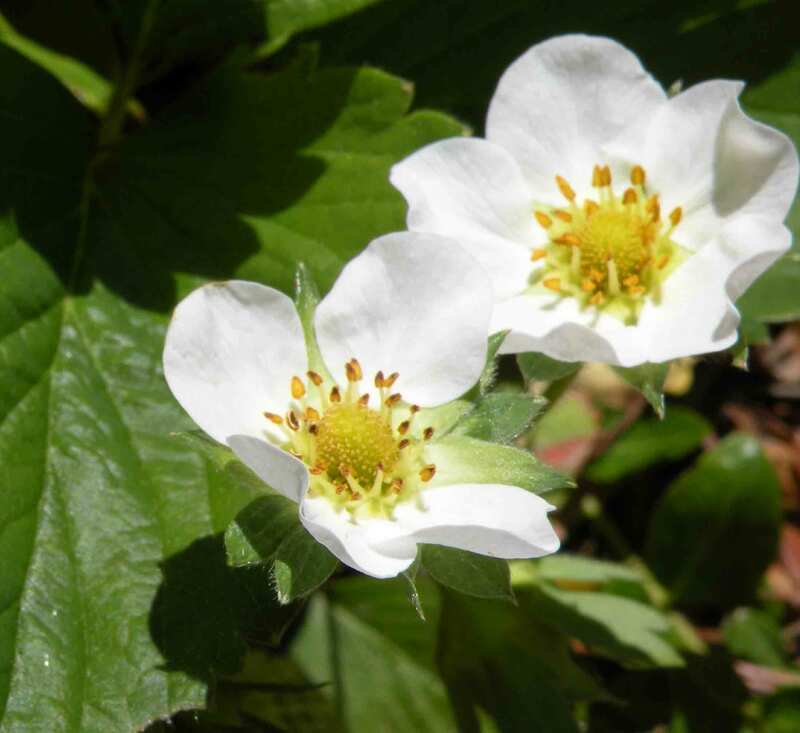 We watched as the days of summer passed and our friend continued to come back to the edge of the strawberry patch, hopping around in the rocks but unable to reach into the middle of the strawberry plants, grumbling just a bit that he no longer could enjoy summer’s fruits as we did! 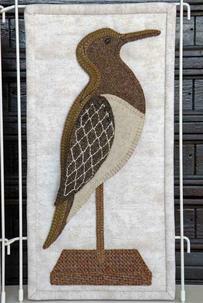 Visit "PATTERNS" or "KITS for Sale" to see more! 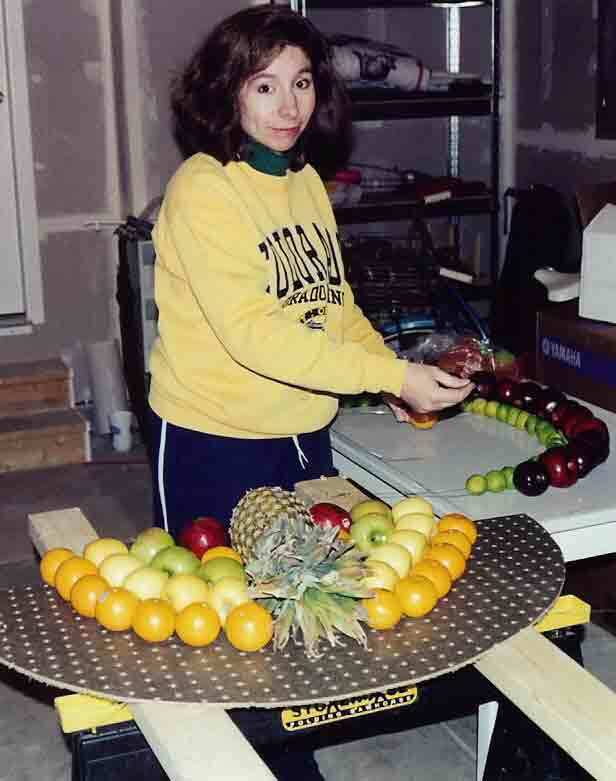 I always believed that the arch of fruit would be a good pattern and something that could perhaps be displayed year-round in a home. 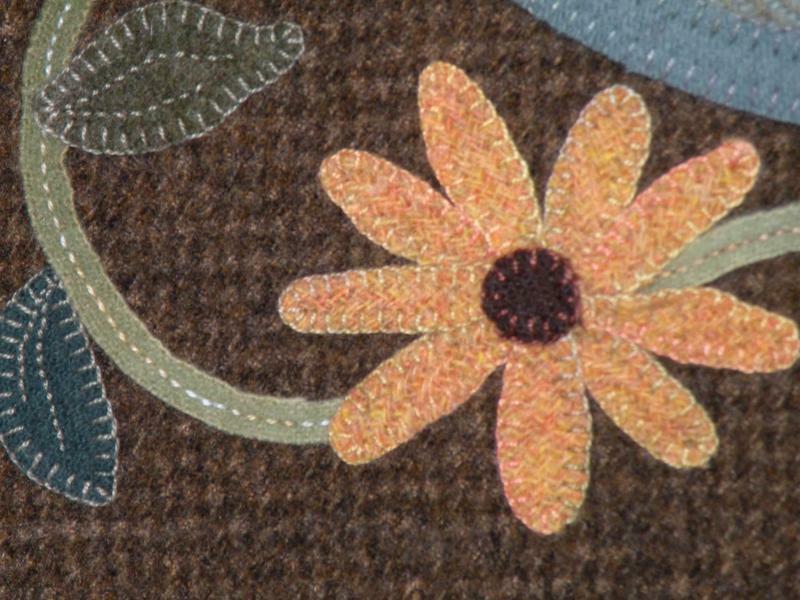 When I was given the opportunity to stitch a piece of artwork and have it displayed at The Gentle Art Thread Company’s booth atTNNA’s Nashville Needlework Show in February 2012, I decided that this would be a fabulous piece to showcase their wool blend threads, and the right time to finish it. 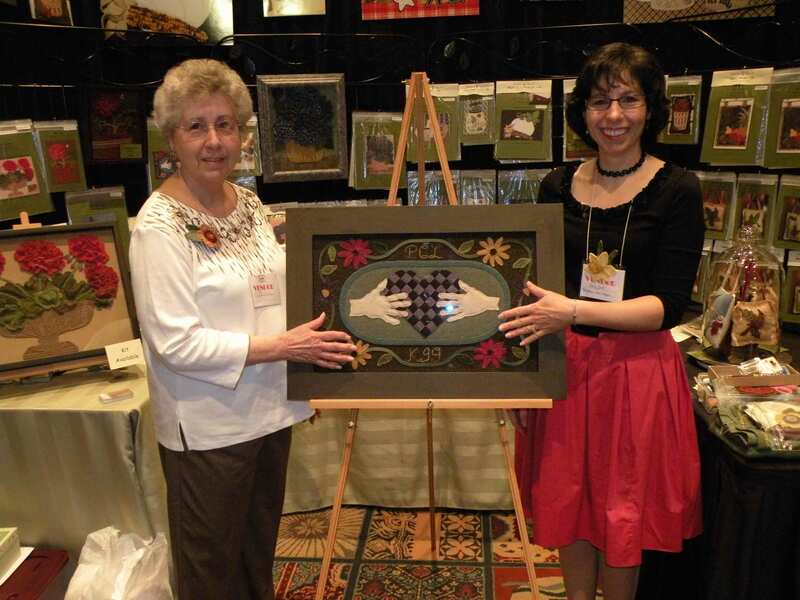 I completed the artwork and the pattern in time for them both to be displayed at the thread show and that was quite an honor! 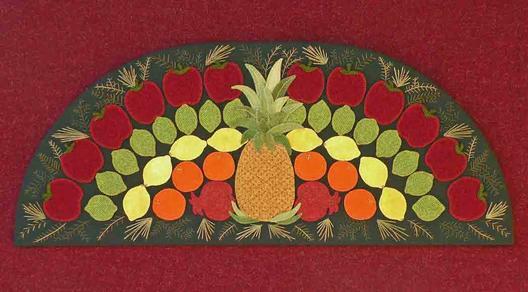 When I designed my original 13 patterns back in 2007-2008, this arched fruit design was one of them. I had all the fruit pieces cut out but at the time the gallery where I have some of my artwork displayed was needing pieces quickly. I knew this project would take some time to stitch and so at the last minute I changed my mind and took single pieces of fruit, added a ribbon and some holly leaves, and stitched the word, “Welcome” and I created the design called “Winter’s Welcome” and sent it off to the gallery for display! Whenever I have been back East around the Thanksgiving and Christmas holidays I have admired these magnificent arches of real fruit displayed above the entries of homes. They usually have a central pineapple, with varying types of fruit on either side and magnolia leaves or other evergreens around the outermost edges. I also have seen upside down arches, or “swags” displayed beneath windows usually with red apples and boxwood. Some homes display a lone pineapple with a bright red bow, placed atop a fence post. For years now, we have put out our colonial-inspired arch of fruit to welcome the holidays and make winter a little less bleak. And for all these years I have been under the impression that our ancestors really were crazy enough to spend precious money on an even more precious commodity – fruit – to welcome the holidays. When I was choosing a title for the pattern I decided to do a little further research on the subject. I knew the reason they were called “Williamsburg” arches was that they referenced Colonial Williamsburg, the living history site where these were well known as decorative highlights during the holidays. I was quite shocked and surprised at what I learned with my research! Although the arches and swags are used as decorations at Christmas, they NEVER were used in REAL colonial times! 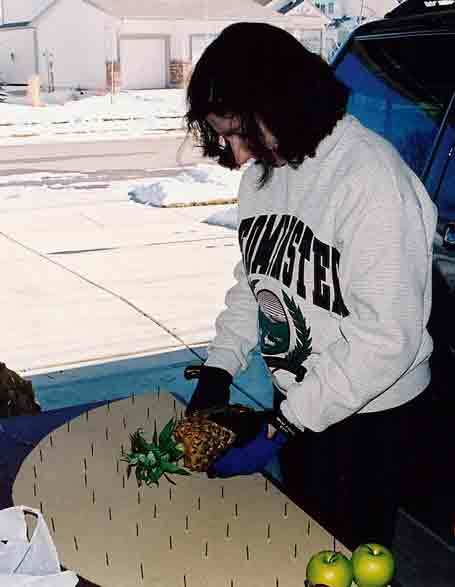 In fact, the website says the colonists probably would have thought anyone who did put fresh fruit outside in the middle of winter to be crazy! I called Colonial Williamsburg and had a lengthy and educational conversation with Susan Dippre who is the Landscape Supervisor for Historical Areas of Colonial Williamsburg. The colonists of the 18th century did use natural materials including fresh fruits, to decorate the insides of their homes during the holidays, but never put fresh fruit outside! They used the natural greenery and berries and branches they found around their homes to add color during the dull days of winter. The affluent of society would spend money to make elaborate sculptures with sugared fruits for their dinner tables, and churches might also decorate with greenery or fruits. But the current day decorating with fruited arches and swags dated back only to the colonial-revival influences of the early 20th century and especially the 1940’s reconstruction at Colonial Williamsburg. At that time Louise Fisher discovered that the great interest of the colonists in fruits and foliage came from those elements being used in architectural designs, seen even on the buildings at the site. A woodcarver named Gibbons decorated buildings with his carvings of fruit and greenery, and a sculptor named della Robbia used his skills to decorate terra cottas with the same. 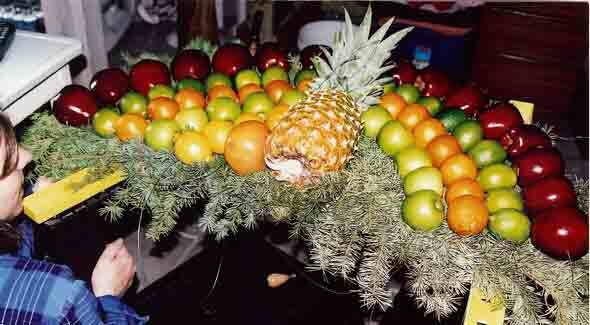 And of course the pineapple was seen in architecture and art, and considered a symbol of hospitality. Ms. Fisher led the charge to place fresh flowers inside buildings at the site, and to decorate more outside with evergreen roping and plain wreaths during the holidays to bring back the influences she learned about through her research. Through the years the reactions have been positive, and Colonial Williamsburg has continued their Christmas decorating adding more elaborate and interpretive displays, including the decorative “apple fans” (window swags) and the fruited arches above the doorways. Colonial Williamsburg sponsors a competition for neighboring home owners who decorate their homes in the “old Virginia tradition” as they like to call it these days, encouraging folks to use natural materials that would have been available during the 18th century. 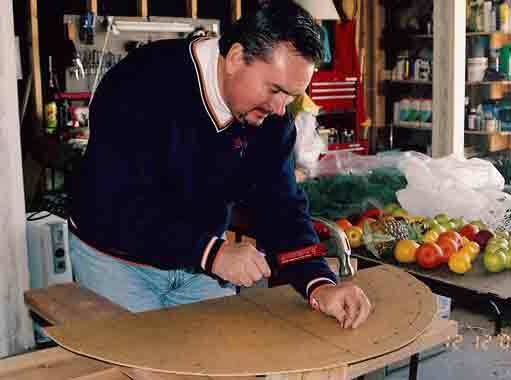 You may even purchase the pre-made boards at Colonial Williamsburg to make a fruited arch for your own home. 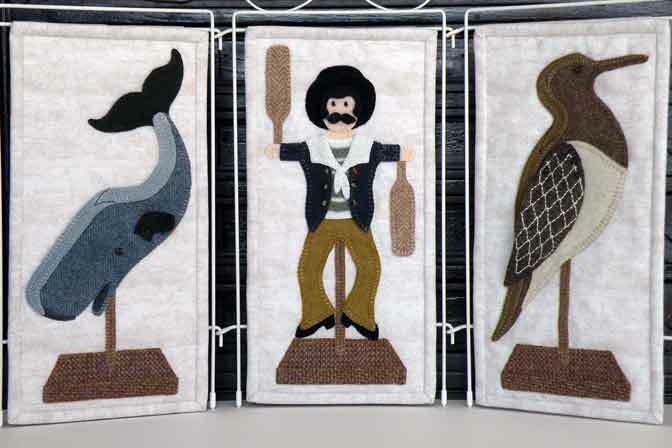 Well, now you know my crazy reasons for creating this wool art piece! My hope is that you might be inspired from this story to create an inside door topper from wool, welcoming family and friends into your home (and maybe even a real fruited arch as well)! And then on a February day in 2005 a rather large box arrived at my front door, with a return address for my parents. 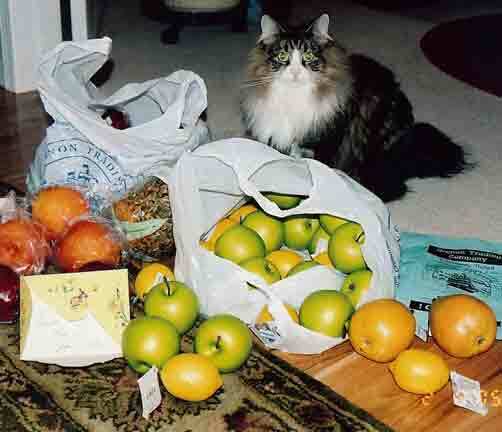 I love getting packages and so I tore into it right at the entryway and with my cat, Fluffer-nutter right in the middle of it all, I proceeded to empty the box and discover quite an assortment of artificial fruit, and yes, there was a pineapple in the mix. There was a note written in my mom’s hand, saying that she and my dad, and Uncle Nessy thought these might cut down on the cost of buying fresh fruit each year for my “colonial arch”. I had been such a “fruit snob” for several years saying that it was better to use the real fruit and spend the money rather than have fake fruit that surely looked it! But these pieces of fruit looked SO REAL! They all had done an amazing job selecting just the right apples, oranges, pears, pomegranates and the perfect pineapple – I could hardly wait to put it all together! And I knew I would be proud to admit that I was no longer nailing up fresh fruit above my door! 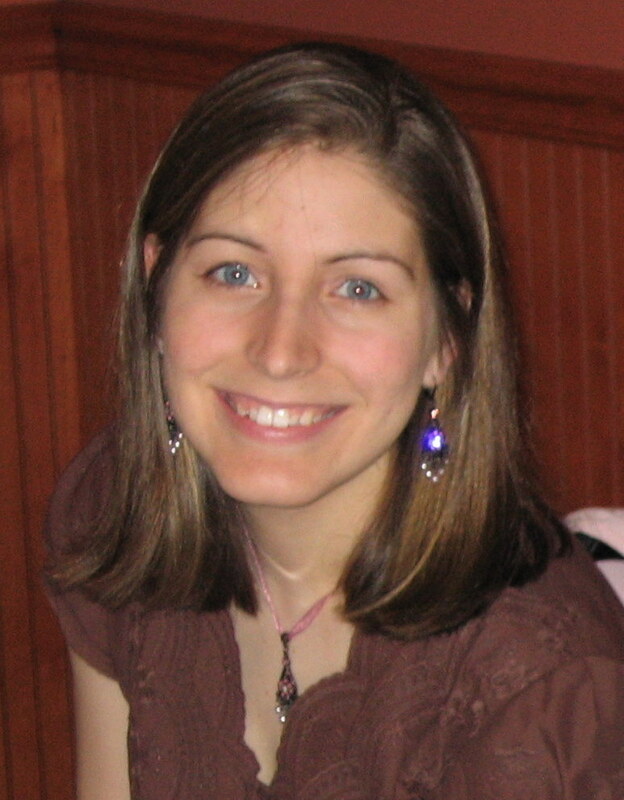 I was born into a French-Canadian and Italian family, and grew up in New England. The family tradition was to visit my French grandmother, “Mémè” on Saturdays and my Italian grandparents, “Grammy and Grampy” on Sundays. Both visits were filled with hugs and kisses, yummy foods and usually lots of other relatives visiting at the same time. We often stayed for supper and enjoyed “tortiere” meat pie or franks and beans down at Mémè’s house, and homemade raviolis and meatballs at Grammy’s and Grampy’s! Mémè’s home was a simple one, having raised up thirteen children in it. She loved flowers and her gardens were absolutely beautiful in part due to the loving care that my Uncle gave in tending them. My Pépè had died shortly after my Uncle returned home from serving his country in Korea and he became a gentle caretaker of his mother for the remainder of her life. I am told that my Pépè was a terrific gardener who raised much of the food that the family ate and began those beautiful flower beds. As I have experienced through the years, my Uncle has his father’s gift for growing lovely things. Mémè always had a wonderful view of flowers from every window in her home. 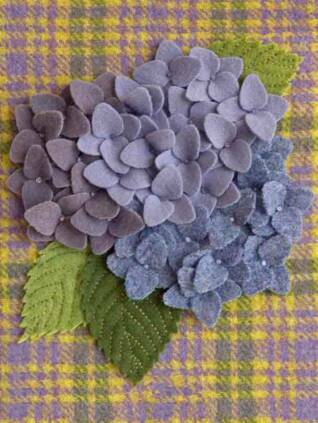 Often there were colorful cuttings from her garden gracing the dining room table. In the summertime, as a child I remember walking up the path to Mémè’s house and seeing these entangled vines of dark and light green leaves wrapped around the end of a fence. The vines seemed to explode with blooms almost like fireworks, popping colors of rich purple, fuchsia pink and bright white. These were clematis vines that my Uncle had planted together at the end of the fence post to camouflage the necessary structure. When my husband and I purchased our first home in Colorado, I remember talking with my Uncle about ideas for plants to put into our new yard. We discussed colors of flowers, the challenges of our climate and what plantings he had success with through the years. It was my goal to try and recreate just a small portion of the physical beauty I had seen as a child in this new yard. I mentioned that I would love for Uncle to write up a list of all the plants he had in his and Mémè’s yard that he could remember. Uncle graciously sent me a card with an extensive list of flowers and trees including selections such as tall phlox, bee balm, lilac, hibiscus, daisy, black-eyed susan, hydrangea and of course, clematis. I sat for a long time with the list and soon began to remember in my mind’s eye where each had been planted in their garden. And not long after that correspondence I received in the mail a small box from a plant nursery! 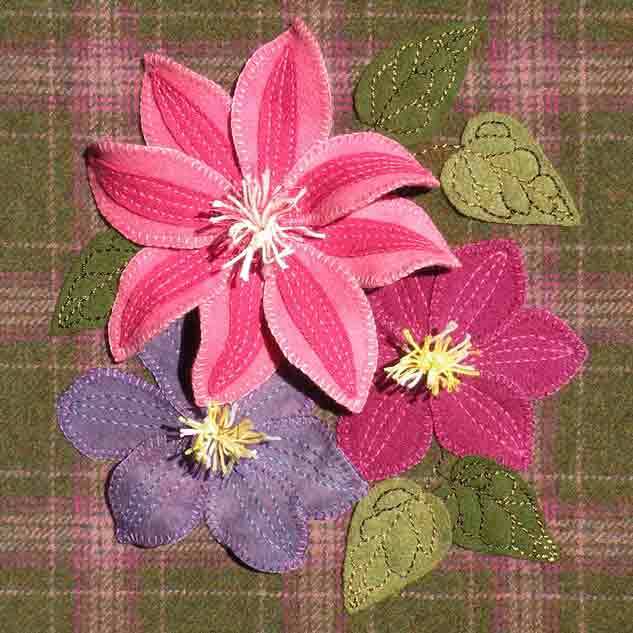 When I opened the box, inside were three gently packed clematis plants – a deep purple, a bi-color pink and a “double” white – exactly the three plants that Uncle had planted for Mémè at the end of their walk! I cried with delight that my Uncle sent me such a wonderful gift for my garden. And when we moved to our new home ten years ago we dug up that cluster of vines attached to a trellis and all, and carefully transplanted it here where we live today! Through the years we have lost the double white plant and have replaced it with a deep magenta variety. When those three plants are in full bloom they are a striking contrast to the mustard colored home that they climb against. My neighbors stop and ask me about those amazing flowers often and I delight in sharing with them the story of my Mémè and Uncle and their lovely garden. Just recently I was home visiting my family and I was sharing with my Uncle about this project. A few days later he handed me several Polaroids of his wonderful clematis vines that he had dug around for in a box of old photographs. We studied each picture, discussing the magnificent colors of the blooms and remembering how much joy those flowers brought to Mémè and to him. 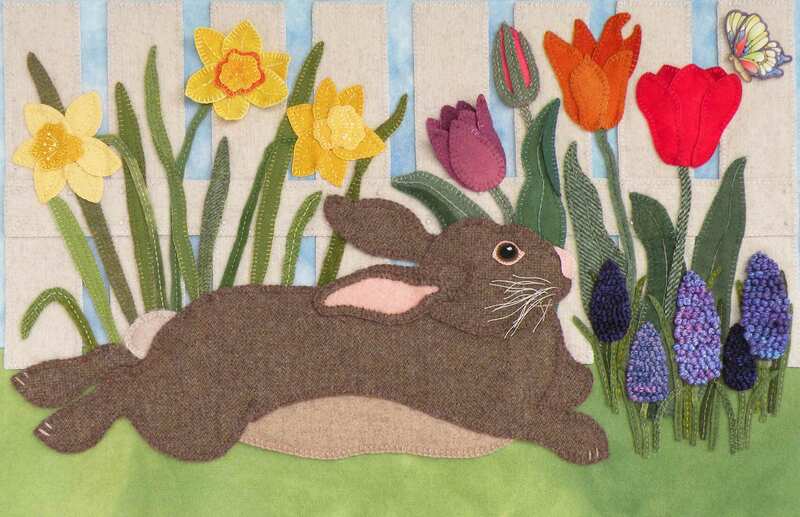 I hope you delight in making this wool appliqué art and perhaps you too will remember fondly a lovely garden – yours or someone else’s! Sitting in her chair in the parlor, Mémè had a perfect view of these eye-catching flowers. It was the entrance to various mixtures of trees, shrubs, perennials and annuals that my Uncle planted and tended for many years in that yard. He knew just how to mix colors and to time the blooming of various plants to make that yard come alive with color and texture all year long! I remember as a child when my mom turned forty because that year my dad purchased and planted a spindly dogwood tree for her as a present. In my minds’ eye I can see dad heaving a pickax into the rocky soil of our front lawn to dig the hole for the new tree. Happy pictures were taken of mom next to her new little dogwood. Not long after that dad put in a second dogwood on the opposite side of the driveway. For years both trees grew and bloomed, and were photographed many times with family members next to their pretty May blossoms, bringing mom a lot of joy. Today only one of those two dogwood trees survives. The canopy now creates shade and a place of respite underneath which sits my mom’s double-seater swing. That is where I often find her on warm summer days and cool fall ones swinging away with a book in hand. A birdhouse decorated with a sunflower (another favorite flower of my mom’s) hung within the branches until a storm took it out, a birthday gift from my sister-in-law many years back. The tree’s bark is lichen covered in places, its branches have thinned with age and it doesn’t seem to bloom as profusely as it did when it was young but all of us still love this beautiful giving tree. I love to watch this tree change throughout the seasons as I travel home often to visit my folks. At the peak of its beauty the cup shaped blooms, pink edged with white centers fill the branches and here and there a tiny amount of bright “new green” pokes out between them. Throughout the summer the green leaves seem to darken and fill in the holes left by the spent blossoms. And in fall mom always comments when the berries turn bright red and the leaves begin to take on a burgundy tinge to them; a sure sign marking their time to soon fall off leaving the tree just bare limbed for a quiet winter of renewal. And so it begins… the seed of inspiration is planted for a new design! A memory such as this comes to the forefront of my mind, a search begins for photographs (or I dig out my camera and go shooting! ), a rough sketch is put down on paper, piles of fabrics and threads are tossed onto my work table and my brain, and fingers, go into over-drive working out how to make this piece unique and different, how to bring dimension and detail into it all. As an artist with no formal art training (we call ourselves “folk artists”) I don’t know if this is the right way to design a pattern or not, but it’s the way I work. 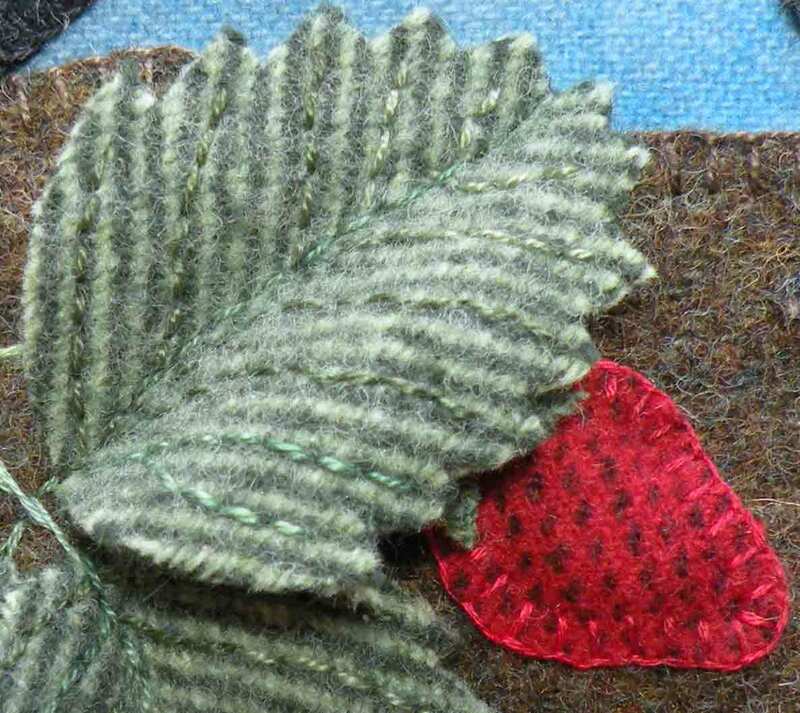 Five years ago this April will mark my launch into this exciting life I now live, taking my experiences of people and places and creating fabric art which I then turn into patterns that are being happily crafted into artful heirlooms by people just like you. I’ve been told I am very creative – but I think I am very blessed, and feel the weight of responsibility to produce an excellent product that yields excellent results. I am striving to lead the way toward elevating the culture of crafts in our country today. Welcome to the orchard! My name is “Cookie” and I’m a belted Galloway cow, and this is my friend, “True Blue” the bluebird. We are helping out with the apple harvest at our favorite orchard! Won’t you come along and join the fun? Follow us back to the barn so we can deliver these “just picked” apples, then grab a basket and an apple picker and hop on board… we’ll take you back out to the apple trees and you can help us harvest the best crop of apples ever! 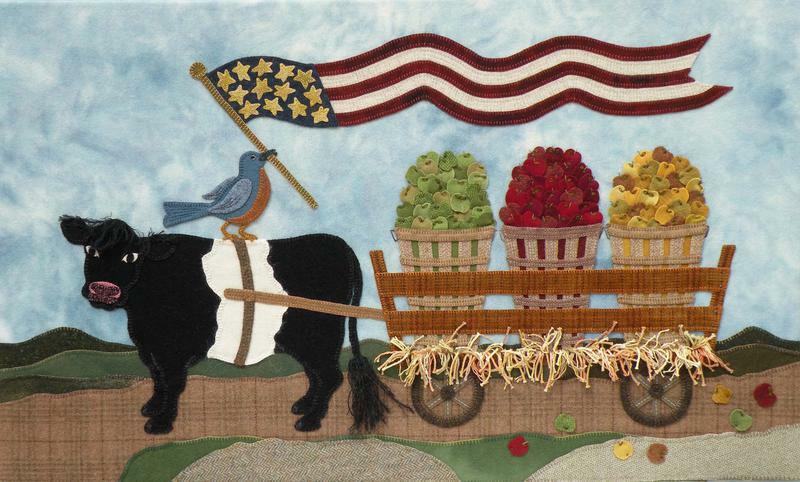 “Harvest Helpers” is dedicated to my two favorite apple orchards… “Sholan Farms” in Leominster, MA (the last remaining apple orchard in my hometown) and “Happy Apple Farm” in Penrose, CO (the apple orchard nearest to where we live), both of which are where Jerry and I love to pick apples!